I loved, loved, loved this book. It is my favorite of the series by far! Jenna wrote this story so well. This story touched my heart in many ways. The way that Jenna put forth the gospel message was fabulous. It wasn't preachy but was course and well thought out. I actually liked the character of Pierre much better in this book than the last. I also liked the character of Amelie. This story is so wonderfully written and beautifully portrays the gospel and love of Jesus. I was so impressed by it. Some of the novels in this series are a bit edgy but this one is much less so and could be read by a very wide audience. I am looking forward to reading more by the author. I received this book for free from the author. A positive review was not required. All opinions are my own. The Oregon Pursuit by Jenna Brandt is a Christian historical romance. It is the fourth book in the Window To The Heart series but can be read as a stand-alone. The beginning of the book recaps the action in the previous books so there are no gaps for the reader.The Oregon Pursuit has a wonderful, warm feel to it, with the action being set around a bakery. Mouth watering descriptions really tantalise the reader's taste buds.The leading lady is refreshing with her big heart, her love for God and yet a very modern outlook on life for the 1870's.The novel is about family. Family pull together. Characters attract others to the family of God as they shine His light in dark places.God's Word is alive in the story which focuses on love, forgiveness and second chances. God's love and grace given to us means that we can extend grace, love and forgiveness to others.Knights in shining armour do exist in the pages of the novel. Men offer protection even when women do not think they need it!I am loving this Window To The Heart series. Each book is linked by characters whilst being totally unique in their settings.If you have never picked up a Jenna Brandt novel, remedy that today... pick up a copy of The Oregon Pursuit and tempt your taste buds and soothe your soul.I received this book for free. A favourable review was not required and all views expressed are my own. With a historical Christian romance, it's hard to go wrong. And this didn't go wrong, exactly. There were many things that I liked; this is my favorite sub-genre (or maybe sub-sub-genre? ), and with that comes some lovely aspects. Let's start with them.What can be better than a French hero with dark, slicked-back hair? Plus, Pierre's very aloof and impressive vocabulary was great. Characters like that are hard to dislike. And he uses a sword instead of a gun! Very old-fashioned, but adorable nonetheless. The faith element was done very well. Pierre's past was a perfectly reasonable explanation for his distance from God, and so was Aunt Marcella's. I was glad to see Amelie asking God for help on more than one occasion. I was glad that she refused to pursue a relationship with a non-Christian, although it completely failed.Aunt Marcella's character arc was done very well. I did not suspect her directly, although I was suspicious she had something to do with something. In fact, all the characters were developed well, which leads me to my main dislike of the book.The prologue was almost 100% telling, and no showing. I found it boring, and I confess I skimmed it more than I should have. I just didn't know why I cared about anything that was being said. Once the main story began, that was not a problem. There were a few instances where a character said more than people usually do in a sentence, but they didn't detract too much.The other main issue I had was the fact that Pierre and Amelie fell in love at first sight, literally. I don't blame Pierre for being attracted and pursuing his attraction, because he wasn't a Christian. (I felt he was quite a bit too forward for a gentleman, though.) But Amelie's perception of him was a little confusing. First, she hates him, and then she doesn't want her aunt to chase him away? I mean, Aunt Marcella was annoying, but she could probably have been used for something like that. :POne more little issue I had: Amelie wouldn't marry Matthew because he would want her to stay home and not work at the bakery. Amelie, to the very end, wanted to be able to work and not just stay at home. That point of view was made clear by the end of the book. (No more detail on that because of spoilers) I don't agree with that view. I mean, when a woman chooses to marry and have a family, that's her duty. She's supposed to devote her life to creating a home for her family and raising her children. And then Matthew had to go and change his mind. I mean, can't a man like a woman who stays home? (view spoiler)[ And why can't Lulu be a homemaker? (hide spoiler)]Two other downsides that were only minor, but I didn't like so much: first, Amelie was way too emotional for my taste. Sure, it's horrible that her parents died, but I'm not that kind of person. A more emotional person (which probably isn't hard to be) wouldn't be annoyed by that at all. I also felt the last chapter was a little unnecessary. I love reading about such lovely characters, but I realized a lot of bakery descriptions are a little tiresome. I suppose it seems I disliked a lot more than I liked, but that's not really true. I did generally enjoy it, but because a lot of that liking goes under the 'Christian historical fiction' umbrella, I didn't mention everything. Overall,The Oregon Pursuitincluded sweet characters and a good plot. Jenna Brandt is an expert at weaving an intriguing story that will rope you in from the beginning, hold your attention until the end, and leave you wanting more. "The Oregon Pursuit" is no exception. I loved continuing the journey of the Window to the Heart Saga. While this story did mention Lady Margaret(the lead character from the first three books), this story focuses on one of Lady Margaret's friends, Pierre. Pierre tried everything that he could to get over and forget Lady Margaret, but nothing worked until he met the beautiful Amelie. She challenges him in a way that nobody ever has before. Pierre really wants to get to Amelie, but she keeps putting up walls to keep him and pretty much everyone else out of her life. Pierre doesn't know what to do. He not only wants to spend time with her, but when her life is in danger, he wants to protect her even though she protests. One major obstacle standing in their way is Pierre's lack of faith. Amelie will not pursue a relationship with anyone who does not believe God. I love the spiritual aspect of this story. The author did an excellent job of showing us that we all need Christ in our life without being preachy or cheesy. This story is very faith and family orientated, and there are many things that we can learn from the characters in this beautiful story. From needing to fully rely on God to never giving up on your family. If you are looking for a good clean read that is both sweet and exciting, then this is definitely the book for you.I received a complementary e-book copy of this book in exchange for my honest review. All opinions are my own. This is book four of the “Window to the Heart Saga” series and takes place in West Linn, Oregon. I thoroughly enjoyed getting to know the people in the story, especially the main characters, Amelie Leclaire and Pierre Girald, the Vidame of Demoulin. Amelie has so much responsibility running the family’s bakery since her parents died, as well as taking care of her younger sister Elise. On top of that, she has to deal with their not-very-nice Aunt Marcella, and many mishaps, which bring big changes to her life. Pierre is a rather arrogant French aristocrat, there for business reasons with his good friend, Lord William Almonbury. As Amelie and Pierre get to know each other, there is an attraction neither of them can deny, but circumstances, as well as Amelie’s religion, divide them. They get their happy ending after many difficulties, but the end of the story both surprised and pleased me. Besides Amelia and Pierre, I really liked Pierre’s friend William and Amelie’s best friend Debbey McCoy. Then, of course, there are Mr. and Mrs. Moore, and the whole McCoy family. Pierre’s love for Amelie changed him…so much that I want to read about him in the first three books of this series. I would recommend this book to everyone. I received a complimentary advanced review copy of this book. The opinions expressed are my own. This is the wonderful conclusion of a 4 book series. (Each book can be read as a stand alone) I am in awe of the writing talents of Jenna. Each book out shines the previous one. This book happens to be my favorite of the series. A short synopsis of the book lets me relay this. Amelie and Pierre have both had romances in the past that has hurt each of them. They find it hard to start over, thus they share a lack of faith in the romance department. But God has other plans for them. This book is truly about faith and family. Putting your trust in the Lord and being there for your family are shining examples of lessons learned in this clean wholesome Christian book. From the snooty Aunt Marcella (whom Amelie could not please - to save her soul) down to Lulu the waitress at the saloon, God loves each of us... no matter who we are or what we've done. The characters in this book are very down to earth and Jenna has rounded them up perfectly to come up with this sweet historical Christian romance. I highly recommend the entire series! The fourth book in the Window to the Heart Saga Series, Oregon Pursuit, is my new favorite. With each subsequent book in the series, Jenna Brandt's ability to weave a tail and captivate her readers improves. This story is about a young lady, Amelie Leclaire, and the struggles she faces in trying to keep the family's bakery afloat after her parents tragically pass. By happenstance, Pierre Girald, the Vidame of Demoulin, who is in West Linn, Oregon, with a friend on business, is a customer at the bakery. This encounter is just the beginning of healing and hope for both the main characters. Through many twists, turns, ups, and downs, a relationship develops centered on God's grace, forgiveness, and love. The portrayal of other characters such as Pierre’s friend William, Amelie’s best friend Debbey McCoy and her family, and the villainous Aunt Marcelline just add to the suspense and enjoyment. The book can be a stand alone or read sequentially. This is the first book I have read by this author and I really enjoyed the story. This book is part of a series but can be read as a standalone. Amelie Leclaire is alone to raise her sister after her parents have a terrible accident. She has returned home to Oregon to run the family bakery. Pierre Girald meets Amelie by chance while going into the bakery one day and he finds he is attracted to her. But with past betrayals Pierre has a hard time trusting and Amelie is cautious about putting her feelings forward. Past hurts, love and matters of the heart bring the two together in a special story that puts past hardships behind. This was a sweet clean story that will make you ready to read the entire series! Another well written episode in The Window To The Heart Saga this time about Amelie meeting up with Pierre and their friendship and love for each other.One of the scenes that I just loved was the innocence of the discussion between Amelie and Debbey about their first kisses. It was so cute.This book shows the strength of the heroine and the loving persistence of the hero. It is engaging and interesting and I really enjoyed reading about it. Pierre has finally met his match but he is going to have to work hard to get her. This is another well written tale by this author and a beautiful addition to the series. With betrayal from those who are supposed to be near and dear his new love will bring him to a special awareness and the chance to fight his own past. I am not a fan of historical reads but this author has found a way into my heart in a painless manner with this wonderful series. Of course, I am going to give my book 5 stars but honestly, this is my favorite book I have written! Sweet, clean romance with lots of twists and turns. You want to read this and find out what happens! Unfortunate editingThe story itself is lovely, however the editing is horrible. Every few pages are missing so it is extremely difficult to follow along. I would love it if they fixed this issue, and would happily read the book and amend my rating. I enjoyed the characters and how the story builds. 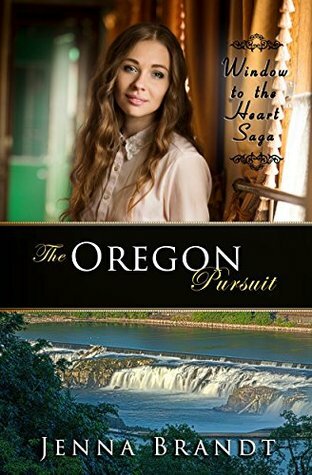 The Oregon PursuitThe Oregon Pursuit is my favorite book so far of the Window to the Heart Sage written by Jenna Brandt. I enjoyed the characters and the story line. Jenna Brandt - My name is Jenna Brandt and I am a historical fiction author and my books span from the Victorian to Western eras to WWI with elements of romance, suspense and faith. I have been an avid reader since I could hold a book and started writing stories almost as early. I have been published in several newspapers and magazines as well as edited for multiple papers. I graduated with my Bachelor of Arts in English from Bethany College and was the Editor-in-Chief of my college newspaper. I'm an on-going contributor for The Mighty Website and my first Blog was published on Yahoo Parenting and The Grief Toolbox as well as featured on the ABC News and Good Morning America websites. Writing is my passion but I also enjoy cooking, watching lots of movies while I write, engaging in social media and spending time with my three young daughters and husband where we live in the Central Valley of California. I am also active in my local church where I lead a grief support group and write features for the church’s creative team.